Kabbalistic Energy Work is a system I have developed to help people analyze and resolve their key issues in life. I have found a pattern of energies around every human being that you might call our “vehicle of Light,” our own personal Tree of Life. I also call it the Human Energy Pattern. We have a dynamic relationship with these energies that changes with every thought, action and emotion. I can help you experience these energies using dowsing and muscle testing. I can also help you work with them to improve your life through prayer and blessing. Dowsing or “divining” began with using a forked stick to find a place to dig or drill for water. Once we realize that we are not finding the physical substance of the water, but the energy of it, then we understand that we can find anything with dowsing. That’s because everything is ultimately energy and everything in the physical world has an energy field, including human beings. My favorite dowsing tool is the L-rod. What are the “two lights of the soul”? I find that all human beings have two invisible rays of light attached to their beings. These two lights intersect us, at any given time, at one of our chakras, which are the human energy centers in Eastern Mysticism. Which chakra our two lights focus on changes as a result of what we are dwelling on at the moment and can give us insight into our lives. I believe these two lights anchor the soul to the body. They are how we interact energetically with everyone and everything in our living environments, especially with the subtle energies that are everywhere around and within us. They also connect us to what I call the Bed Pattern and the Human Energy Pattern. What is the Bed Pattern and how does it differ from the Human Energy Pattern? I began finding a unique pattern of energies (channels or rays of invisible light) around beds in 1996. Since then, I have found more and more elements of this pattern. These energies reflect our health and well-being, or lack thereof. They can be out of balance as a result of illness and/or unresolved issues in our lives. We can detect the imbalances with dowsing and correct them with prayer, bringing more healing and balance into our lives and helping us to resolve our issues. We imprint this pattern of lights or energies around our beds, what I call the Bed Pattern. It is actually around each of us and goes with us wherever we go. I call the energies that can be found around our bodies the Human Energy Pattern. We hook up to the Human Energy Pattern with the two lights of the soul. I believe I have found a direct connection to this unique energy pattern in Kabbalah. Kabbalah is a body of teachings that is the essence of Jewish mysticism. It is an oral teaching that has been handed down from teacher to student since the time of Moses. Much of it was finally written down around 100 AD. More was written by Kabbalistic sages about 1500 A.D. and much more since then. These teachings have profound implications in our modern-day lives. Kabbalah was adapted into Christianity during the Renaissance and has been integrated into Western Hermetic tradition (tarot, for example) and many Mystery Schools, such as Freemasonry & Rosicrucianism. What is the “Kabbalah connection to dowsing”? After studying the Bed Pattern for several years, finding more and more of the complete pattern, I realized that the complete Bed Pattern is almost identical to the kabbalistic Tree of Life. The Tree of Life is the central feature of Kabbalah. Legend has it that this pattern of energies or “lights” was put into place before creation. Kabbalah teaches that everything is ultimately patterned after the kabbalistic Tree of Life. The Tree of Life is real, not just a symbol, and you can learn to find it and work with it. In this session, you’ll see how I do this and you’ll experience the reality of it. How do the “two lights of the soul” relate to the Human Energy Pattern? 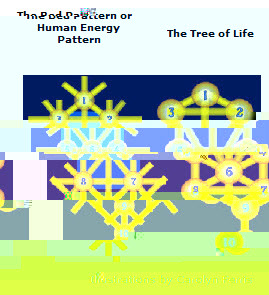 There are ten centers or Sefirot in your Human Energy Pattern, your own personal Tree of Life. Each of these centers represent a different aspect of your life, a different attribute of God in your life. Your two lights intersect at or focus on one chakra at a time. They also come in at four different angles, which are illustrated below. You can see which of the ten centers or Sefirot the two lights intersect or attach to with each angle. These angles of intersection change with our changing focus of thought. They are to be viewed as though looking down from above, with the top of the head represented by the circle with no number in it. The rest of the energy pattern is around you, extendinng about ten feet in front of you. How can you help me analyze the important issues in my life? This is a very logical and rational process. I have a basic understanding of each of the seven chakras (Eastern Mysticism) and each of the ten Sefirot (Western Mysticism). I get you to think of the most important unresolved issues in your life, one at a time, and I use the ancient art of dowsing to see which chakra connects to which Sefirot by dowsing your two lights. I then use my basic understandings of these two mystical systems to give you some insight into what is keeping your issues unresolved. How do you help me resolve my issues? I get you to think of your issues again, one at a time. When you think of an issue, you vibrate at the frequency of that issue in your life. I then take a physical object from you, such as a piece of jewelry or a pair of eyeglasses, and I bless it or “charge it” with the energy of healing, balance, and resolution of that particular issue in your life. Basically, I charge your object with the inverse energy of that issue in your life. Then when you think of the issue and vibrate at the frequency of that issue in your life, you trigger the energy of resolution. I can then use dowsing to determine which chakra your two lights focus on and which Sefirot they attach to. Then I can give you some insight into what you need to do to resolve that issue. How will I know that your energy work has been affective? I use muscle testing to demonstrate to you that what we have done together has been effective. Remember, I do not “heal you” or resolve your issues for you; that’s up to you and what you do in your life. I simply give you a little practical advice and help you energetically to know what to do and how to do it. After we work together, every time you think of your unresolved issues, you will be strengthened rather than weakened. You will vibrate with the energy of resolution rather than the energy of the unresolved issues in your life. Also, when someone else stands in part of your energy pattern that is out of balance, her or she will muscle-test very weak. Once we correct those imbalances by charging (blessing) the objects, the imbalances will be corrected and that person will muscle-test strong while standing in the same spot. They will be strengthened by your energies rather than weakened by them. This is a vivid demonstration of the existence of these energies. I charge $100 for this service. I would like to hear from you later as to whether you feel that my work has helped you or not. My preferred method of communication is email. Click here or call 1-877-369-7464 to schedule an appointment while I’m in your area.